Three identical getaway lodges situated around a secluded beach. 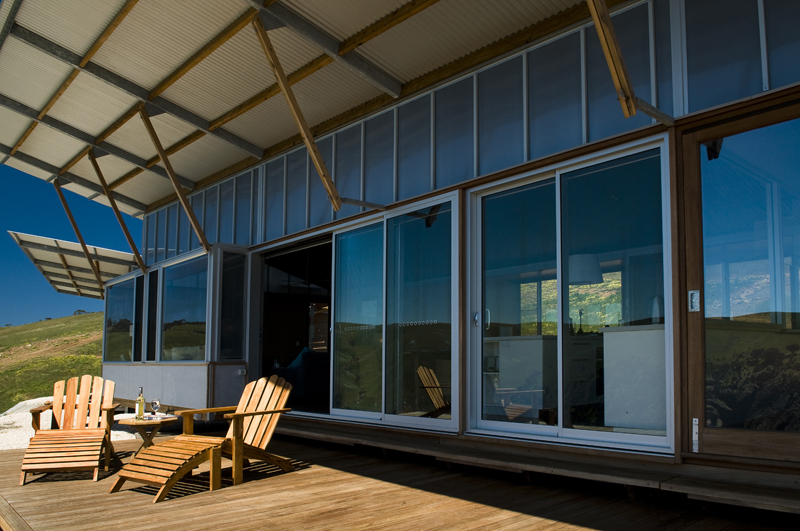 ''Seals and dolphins splash so close to the lodges Damien and Anna Brown build on Kangaroo Island, that bathers can discreetly watch the mammals at play from behind glass panels in the bathroom's shower zones. "The need for a building to respond to its environment is paramount in good design - more so in the wild", says Architect Phil Harris, who designed the Browns' dream retreat. His vision when building away from urban sprawl is to ease back on the slick parameters that define a city dwelling - compact, clean, clever, efficiently planned. "Loosen up the floor plan. Time is no longer of the essence, so what's wrong with a stroll to the bathroom, having a studio out at the back. It's a great opportunity to become involved in a place you love - or why would you bother to buy or build?" he says. "In a natural environment [be it beachside, the mountains or a bush paddock], contemplate the location...how it works through the seasons, where the water flows through, the soil, the nature of the trees that make up the landscape. You become in awe of the sea, lightening storms, stars in the night sky." Tuning into the surroundings also means sourcing your building materials to compliment the environment. Mr Harris's advice when considering the design of a holiday home is to pick and architect who empathises with the region. "Build with timber, stones and earth that is local and it all starts to connect. It's as much a soul search as an accounting exercise." he says. "[I] devise how to pragmatically deliver projects in remote Australia. You can't get every trade there so you need to pare back, linking sustainable and cost-effective architecture," adds Mr Harris, whose wilderness projects include building in Arnhem Land. "Away from suburbia, costs can escalate quickly," he adds. "Not everything is at hand. You have to be resourceful." - Gary LePersonne, Editor, Sunday Age / Living by Design. 'Call of the Wild', July 2011.